I've brewed a Golden Belgian Strong several times using White Labs WLP570 and just can't seem to get this yeast to flocculate and drop out. The beer ferments out fine and I reach my FG like expected but the yeast seems to hang in suspension no matter what I try. Initially I tried kegging it and letting it set for 4-5 weeks at about 38F but I still got a yeast smoothine when I tried to pour it. I finally gave up on that batch thinking I had really screwed up somewhere in the process, dumped it and tried brewing it again. I haven't kegged it yet but still see an enormous amount of yeast still in solution. I've conditioned it for over a week at 36F and haven't noticed any clearing. I then tried adding gelatin a couple of days ago and seeing if it would settle out but see no change. Although I know this yeast strain is a low flocculater I'm at a loss and just don't know how to get it to drop out of solution or if I'm doing anything wrong. Any help from someone who has ran into this problem with this strain or any type of similar yeast problem would be much appreciated. Re: White Labs WLP570 Smoothie! It sounds like you have some temperature control - have you tried dropping them to 30F for a week or so? That might help. Do you want to fine to get rid of it, or are you open to filtering? I think those are your best bets if crashing it doesn't help. That really doesn't sound like 570 to me. Low flocculators drop eventually. Sure it isn't a bad haze? What was your recipe? Any adjuncts other than sugar? I did try dropping it down to 38F but didn't think dropping it lower would do much good but I guess it couldn't hurt. I also tried fining with some unflavored gelatin but haven't seen any significant change and I don't have a way to filter so that's out. The recipe is very simple consiting of about 29 lbs of Pilsner and 11lbs of Carapils and 2.5lbs of cactus flower honey with a 90 minute boil for a 10.5 gal batch. The first time I made it I had won two medals with it but after following the same process/recipe I just can't seem to get it to clear anymore and this is my third time making it. 11 lbs of carapils? That's not a typo? That's more than 25% of the grist. Ya Tom, you're right. It was 11 ozs not lbs. LOL, that's very funny (glad it was just a typo). On the other hand who doesn't like a full bodied Golden Strong Ale every now and then? I brew a Strong Golden every year and have exactly the same problem with clarity in the keg. In my experience no course of action or time produces a very clear beer. Like you I have tried gelatin, near freezing temps, and six months of aging. Last year in frustration I bottled the keg with my beer gun just to get it out of there. It was with sheer joy that I discovered clear beer in the bottle within a couple weeks. I'd suggest filling a bottle from the tap, leave it for a week or two, and see what kind of results you get. I have had good luck with this but otherwise this yeast is impossible to clear. The only explanation I can come up with is that the greater surface area/beer ratio of the bottle has something to do with the clearing. Thanks, you may be onto something. I dropped the temp several days ago and still don't see much of a change. The first time I made this I wasn't kegging and bottle conditioned it. Since I've been kegging I haven't been able to get it to clear at all. I'll give it a few more days and then give this a try. The only explanation I can come up with is that the greater surface area/beer ratio of the bottle has something to do with the clearing. It's not the surface area/volume, it's how far everything needs to fall in order for the beer to be clear. The distance is much shorter in a bottle than in a keg. Also, in a keg you're drawing from the sediment, in a bottle you're pouring off of the top. That occurred to me too except that right before I bottled the beer I took a sample from the top of the keg with a wine thief and it was still pretty cloudy. This is after being in the keg for 4-5 months. After two weeks in the bottle the beer was crystal clear. I really believe that something happens when you put it in the bottle. I have experienced this at work with the unfiltered-bottled conditioned ciders we do as well. At what temp are you observing this phenomena? If the kegged sample is cold and the bottles are at room temp the difference could be chill-haze. 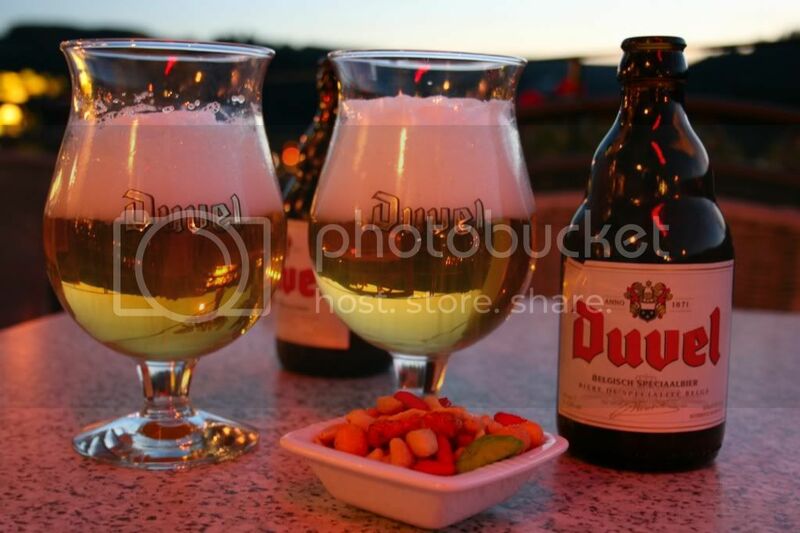 And I drank four Duvel's last week and I couldn't claim they were very bright. It's a slightly hazy beer as it is. UPDATE: I went ahead and bottled the beer and it's been about a week and a half. I had one last night and it was nearly crystal clear! Bottling does help but I would still like to be able to enjoy this beer from the tap. I think I'll try switching to the Wyeast equivalent next time and see if that makes a difference unless anyone has any other suggestions short of filtering.